I have been lucky to get hooked up with I/O Bio, a company based in Boise, Idaho. 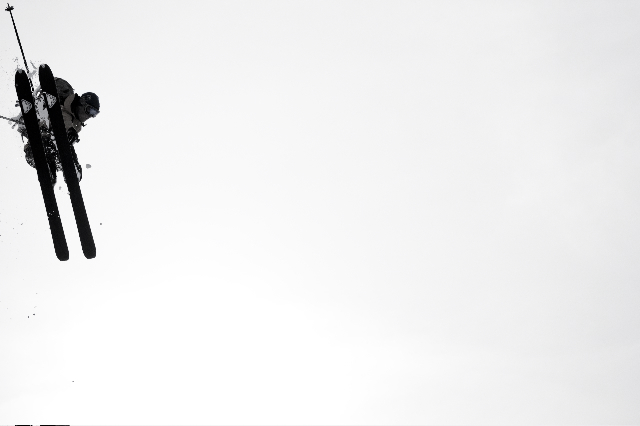 They produce very well made merino wool garments that combine excellent performance in the outdoor elements with styles and colours that look sharp everywhere. Hence Inside/Outside. Awesome warmth to weight ratio, very soft feel, and multiple days of use with minimal stink factor. This is a prototype that I got from Greg, which I am assuming spawned the Arrakis line of packs now available. Definately innovative, and has some features that I really like. I think that the model I have is around 70litres, with a rolltop that can be clipped down the sides for smaller loads and clipped to itself if needed. A bit too big for day-to-day use, I find this pack is perfect for multiday camping trips. This bag weighed in at 1950 grams with the original hip belt (recently upgraded to a bigger yet cushier one), which is very light. The material that this bag made out of is BOMBER! And very waterproof, which means I can throw this bag down in the snow without worrying about getting any of the contents wet, or adding more weight from absorbed water. A very simplistic design with three low profile pockets on the exterior means I needed to figure out a good system for the organization of the winter camping gear that I normally fill this pack with. The blue zipper on the top/front of the bag accesses the pocket that has proved to be the perfect spot for goggles and other small bits and pieces that are needed throughout the day. The small yellow zipper on the one side is the pocket for my shovel handle, probe and snowsaw, and the blue zipper running up one side is the spot for my shovel blade, spare gloves, and room for a couple more “stuffable” items. Lunch and water go on top of all the gear in the main compartment that won’t be needed until camp set-up, and is easily accessed through the rolltop. The main compartment can also be accessed via a full length side zip, key to dig out anything I might have forgotten to pack in a more convenient place. All zippers are waterproof. I was not sure how I was going to fix my ski’s onto this pack, as it didn’t come to me equipped with the side loops and buckles I am used too. Problem solved by threading some stretchy rubber ski straps thru the hard plastic tabs welded onto the pack body at strategic places. I have even strapped my sleeping pad to the front with the same system. The coolest feature on this pack is the suspension. The hip belt is attached to the main bag using Arcteryx’s Load Transfer Disc, which for me allows unprecendented freedom in the hips, the load being transferred right to the small of the back and pivoting neatly with any upper body movement. The shoulder straps are fastened using the Gridlock system, providing micro adjustments of the shoulder straps to get the fit just right. Hands down this pack carries (both up and down) like none I have tried before. Gridlock system=easy fine adjustments of shoulderstraps. If you have watched any of Greg’s movies, I am sure you recognize this bright orange backpack. He gave it the beats for a couple of seasons before I got my hands on it, and it was in fine shape. Like all arcteryx gear, well designed, good craftsmanship, and solid. And finally, here’s a few words about some of the gear that helped out on our trip in the St Elias. 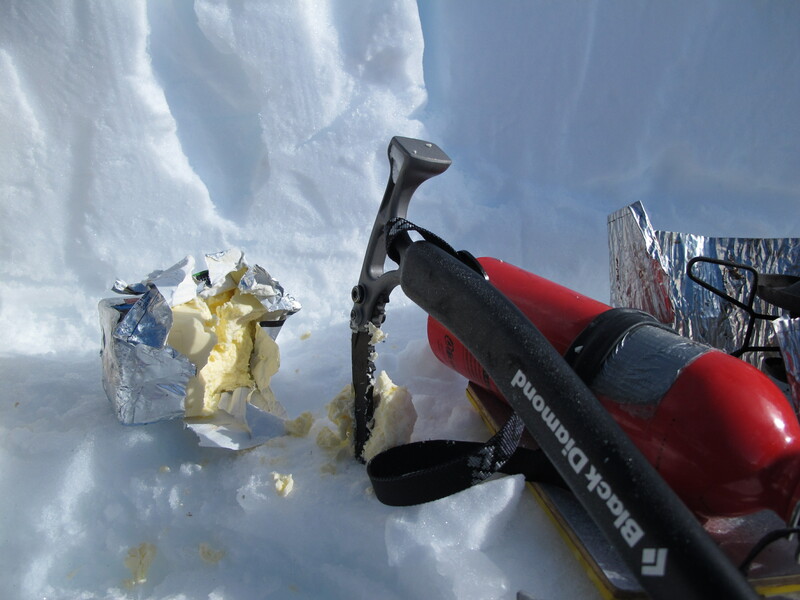 These mountains are wild and remote, and being properly equipped is essential. 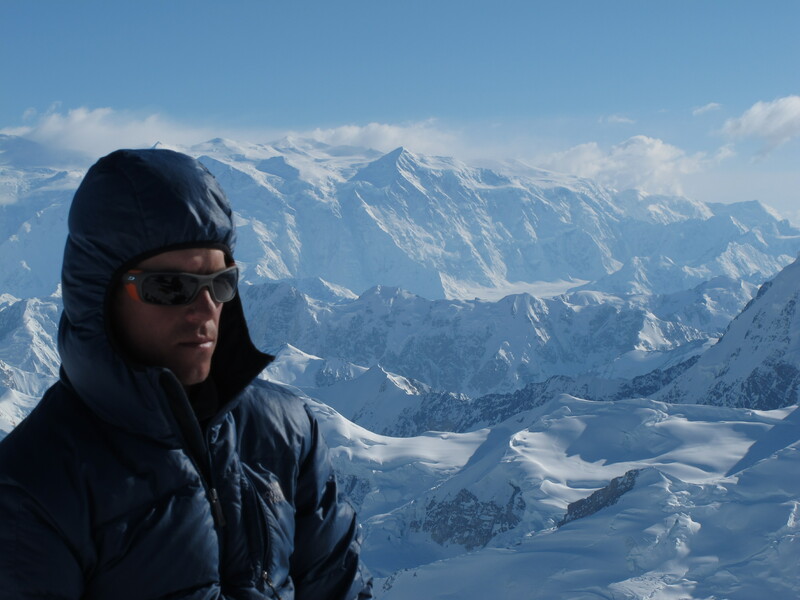 I will start with the Bivouak, a new model of glacier sun glasses by THE name in mountaineering eye protection, Julbo. At last, a pair of shades effective at cutting the intense and potentially damaging glare of the the sun without looking like a member of some 1970’s expedition! Available in a number of lens/frame combos, our team chose the Camel lens, which is both photochromic (darkens and lightens with light intensity) and polarized to cut down on reflective glare. The Camel lens is also coated with an antifog treatment combined with some small ventilation holes, which I have to say worked extremely well, I had zero fogging problems, and I am a sweaty guy. Another cool feature for the Bivouak is the removable side shields, which are fastened by a strong magnet, and are on or off in seconds. So when you are ready to hit the town after that gnarly trip in the mountains, no time is wasted. The part of the arm that hooks over the ear is rubber over a flexible wire (remember Gumby? ), so fine adjustments are simple. The Bivouac also comes with a safety strap which clips through a small hole in the end of the arms, and a hard case to keep them in one piece in your pack. When I got out of the plane I was wearing a different pair of shades, and I quickly switched to the Bivouak, and the difference was substantial. The other pair never saw the light of day for the rest of the trip. Joey rockin the Julbo Bivouak with Logan as the backdrop. I only used the next item once due to our thankfully mild temperatures, but on our way back from summiting Mt Steele, I was very happy to sink my hands into the Hestra Heli Mitts for the final climb and descent back to camp. It was 10pm, and energy reserves were low, but the combo of a few sips of hot soup and these toasty mitts helped for that final push. I have been a long time fan of the Hestra Heli glove, the only glove I have found that lasts more than a season, so it was a no brainer what to get for a mitt to be prepared for Yukon weather. The Magnusson family has been producing top quality handwear in Hestra, Sweden for over 70 years, and have a huge selection of models. Check them out! Hestra Heli Mitt- toasty warm when the weather is not. 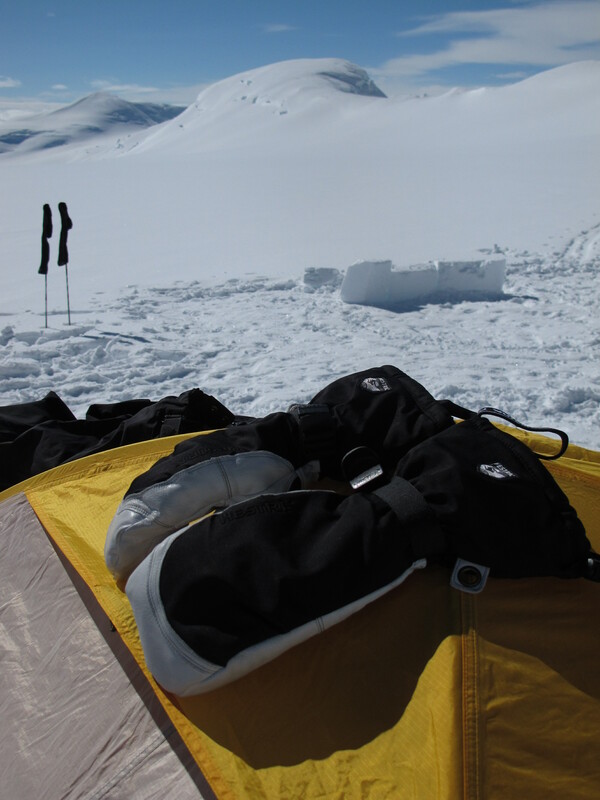 Many thanks again to those that helped out with gear for the St Elias expedition. 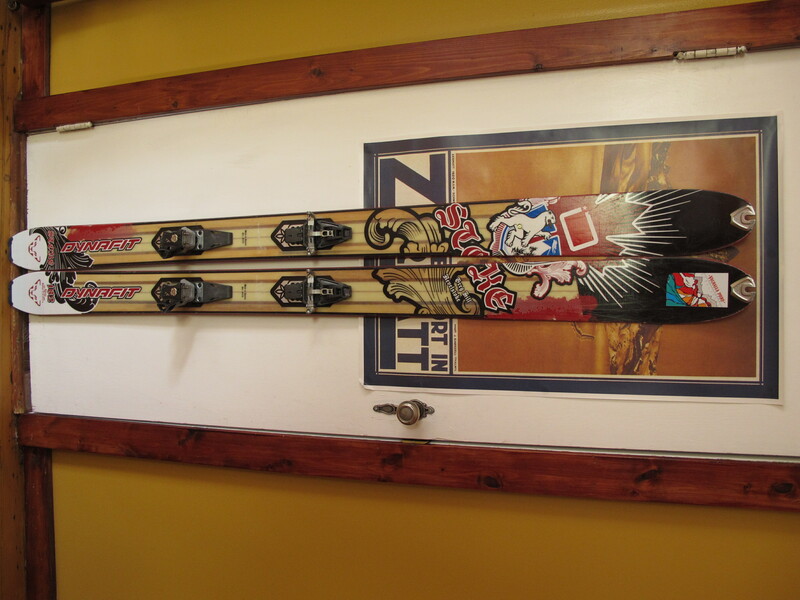 One of the most exciting things to happen this winter (2010) is the release of my good friend Greg’s “signature” ski from European backountry specialists Dynafit. Greg’s collaboration with Dynafit has produced the “Stoke”, a light weight powder ski with a name that pays homage to the Revelstoke area, renowned for its backcountry skiing, as well as that amazing feeling we get when we are out in the mountains, and of course, the endless energy that keeps Greg ticking like the Energizer bunny. Talking about skinning, I am also a fan of Dynafit’s skin tip attachment design, a small rubber bulb that fits neatly in the notch in the tip of the ski. With some rando racing in my past, I like having the option for skin removal from front to back, without removing the ski’s at all. Also, the low profile hook on the tail doesn’t get caught on the straps of my back pack when removing skinned skis after a bootpack. Makes for fast transitions, which coupled with the light weight ski, amazing glide from the skins, and Greg breaking trail equals more powder skiing! Congratulations Greg, great ski! Oh yeah, here’s a fun shot of the bases.